Many People Benefit From Shared Office Space, But Don't Let It Ruin Your Local SEO! When sharing offices with other businesses, be sure you follow these tips to avoid confusion for prospective clients and mistaken address and phone merging on search engine listings. It’s your big moving day! You've unpacked boxes of books, computers, and office décor at your new location, but did you remember to move your law office online, too? If not, both search engines and your online visitors are probably confused, and that little oversight could limit the success that you hoped your move would bring you. Local search engine optimization, or “local SEO,” is one of the biggest ways that businesses are found by potential clients online. When you move offices, it is crucial that you update your information on local search and listing sites, like Google My Business, Yelp, and Facebook Search. If you don't update all your listings after a move, you won't get found as much as you should, and you’ll lose visibility with some of your very best clients locally. The challenge is that there are dozens of places where your information can and should be listed online. And your information should not only be there, but it should also be listed consistently and correctly. If critical information about your law firm isn't accurate on all the most-used listing sites, your local visibility will be affected, and your digital marketing efforts will falter. 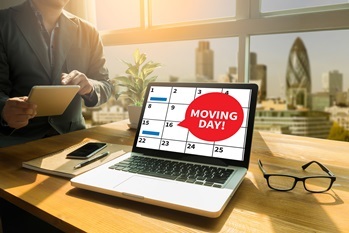 The good news is that, with a little planning and effort, you can set yourself and law office up for a move that goes smoothly, both online and off. Notify your marketing partners. With everything that goes into moving a law office, it can be easy to forget to notify your digital marketing partners that you’re planning on changing location. However, there is a lot we can do to make sure that your website and local presence are ready to go, no matter where you are. Find the best address to use. You might need to do some research on the best version of your address to use. The same address can be written a lot of different ways, but you need to make sure you choose one and stick with it across the Web. Look at how your new address is listed on Google Maps, at the post office, through delivery services, and on official mailings to get an idea of your options. Update your office page. The office page on your website is a major resource for new visitors, so make sure the address on your office page is updated to the new address and matches your local listings. This is also a great time to update the driving directions, map, and photographs on your office page (and the rest of your website). Let Google know you moved. You can submit your updated website to Google index, via the Search Console, to speed up search changes for your move. Update Google My Business. Your business listing with Google is one of the most important and obvious listings to update. We have had good success with these updates by making all other changes first, submitting public edits to the listing, and waiting at least a day to update Google. Use local listing tools. Local listing tools make it easy to update your business listings across the Web. This might mean setting up and using the DSS Local Listing tool or Yext—or both if there are major issues—to sync your listings and make sure everything looks right everywhere. These kinds of tools are a huge timesaver, so ask us for a demonstration before you try to find and update everything by hand. Update Facebook and social media accounts. Social media search is an increasingly important source of local visibility, so make sure that you change your address on Facebook, Twitter, LinkedIn, and any other social media sites your law office uses. Update your legal profiles. While you’re updating your social media accounts, don’t forget to also update your legal profiles on sites like Avvo, Martindale-Hubbell, and others. Check your email signatures and other branding snippets. Is your physical address shown in your law office’s email signatures? Is your old location incorporated in your website headers, newsletter templates, or images? Make sure you check everything and make updates so that all your materials and branding efforts are consistent with your new location. Consider your local SEO strategy. Even a small move can mean adjusting your local SEO strategy to fit. For example, is your new address in a new city? Will you be trying to reach new local markets from your new office? In either of those cases, location and keyword terms will need to be reviewed and re-strategized. Now, you’ve really covered all your bases. As a bonus step, take a moment to create an annotation in Google Analytics on the date of your move. Having this data point in place will help you track your digital performance while you settle into your new office. You might also want to take some screenshots that show your local performance before the move, just so that you have a quick visual to compare later. Tracking is a crucial part of a successful local SEO, so you should find ways to track your local visibility before and after your move. If you added an annotation in Google Analytics and took a screenshot before you moved, then you’re already halfway there. Set a reminder for two weeks after your move, and set aside some time to do any additional cleanup that might be needed. We recommend manually searching Google for the old address and checking in again with your local listing tools. This will help you find any stray citations or legal profiles that need to be updated. After the office has moved and posted a few times on social media, we also recommend sending out an email blast to let everyone know that you are settled into your new location. Don’t forget to get lots of new images of the new office space, signage, meeting rooms, and more to use on your website, Google, profiles, and local citations. Every law firm is different, and every move poses different challenges. Although you now have all the basics, there are probably a few more things to consider that are unique to your law firm. If you need help when the time comes, or if you just don't have the time to sit down and let the entire internet know about your new office, call us at 888.886.0939 or sign up for a free demonstration of DSS—just let us know you want to see the Local Listing Builder tool in action.